This month delivered a huge win to Surfrider's legal team, our San Mateo chapter, the power of grassroots activism and everyone around the world who cares about beach access in California. But even as we continue rejoicing – a victory like this deserves extended celebration – the inevitable question arises: What's next for Martins Beach? He can work with state and regional agencies, along with local residents and visitors – to create a plan that respects both the public's rights and his dreams for the property. The State Lands Commission can proceed with eminent domain and purchase the easement (in this case, the road leading to the beach) even if Khosla is unwilling to sell it, thereby establishing permanent access to the beach. Ideally, Khosla would opt to move in the direction of both the law and the public interest despite his threat to "litigate for the rest of his life." Rather than leave the next step purely to chance, however, Surfrider Foundation encourages the State of California, through the State Lands Commission, to continue moving foward with the eminent domain action the people and state legislature have expressedly asked for; over the past few years, legislation by State Senator Jerry Hill (D-San Mateo) has directed State Lands to explore the possibility of eminent domain, to negotiate with Khosla regarding potentially buying the 6.4-acre easement (negotiations were unsuccessful due to Khosla's exhorbitant asking price) and to create an account to maintain funds specifically for the purpose of acquiring the road. All of which leads to the next inevitable question: What can you do to support beach access at Martins Beach and, by extension, throughout California? Show up at the next State Lands Commission meeting, Thursday, Oct. 18 at 10 a.m. and, during public comment, ask the Commission to pursue eminent domain. Contact the State Lands Commission at (916) 574-1900 and tell them you support the pursuit of eminent domain at Martins Beach. Tweet at @CAStateLands and call for them to #OpenMartinsBeach through the use of eminent domain. Make a donation to the Martins Beach subaccount. If you or someone you know has a history of visiting Martins Beach, fill out the Coastal Commission's survey. 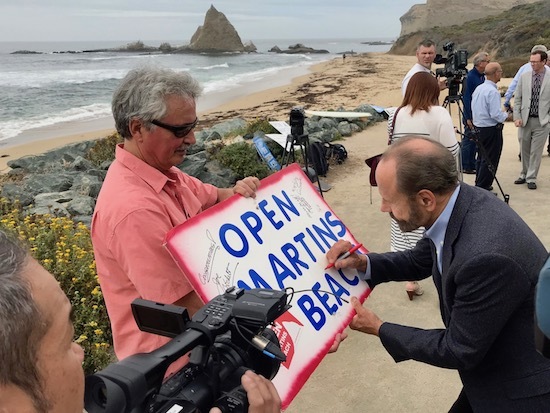 Senator Jerry Hill, right, signs the original "Open Martins Beach" sign held by former San Mateo Chapter Chair Ed Larenas.